The 900-tonne hydraulic stressing cylinder, available from Enerpac , looks like a formidable multi-barrel cannon of the type slung beneath fighter jets, but the purpose of this dark cylinder is constructive and not destructive. The capacity of the 900-tonne hydraulic stressing cylinder is in the range of 110 to more than 1000 tonnes and the stroke length is in the range of 150 to 300mm. The 900-tonne hydraulic stressing cylinder, supplied and customised by Jonel Hydraulics, will be used by Post Tensioning and Grouting to tension dozens of high tensile stressing strands simultaneously for bridge sections of the new $NZ250 million-plus Tauranga Harbour Bridge crossing. “Use of the cylinder to stress the concrete beams on-site will not only make the work quicker but also simpler as the ability to apply large loads means less tendons are required. Stressing work can be potentially hazardous, and having less stressing operations to perform will make it safer,” says Post Tensioning and Grouting supervisor John Grant. In addition to achieving the required outcome for the project constructor, Fletcher Construction, the 900-tonne hydraulic stressing cylinder will be used in ongoing construction and civil engineering projects. Similar cylinders were used on the London Eye, for example, and also the Dubai Highway in the United Emirates. The 900-tonne hydraulic stressing cylinders are manufactured at a specialist plant in Europe that has built a worldwide reputation for manufacturing stressing cylinders and heavy lifting technology, including that used to raise the Russian submarine Kursk from the ocean floor. Enerpac's 900-tonne hydraulic stressing cylinders are used in pre-stressing operations for the stressing of single and multi-strand systems. Many, including the 900-tonne hydraulic stressing cylinder, are equipped with hydraulic nose cones which after the cylinder’s initial extension push the locking wedges in place mechanically while the cylinder retracts, then extends again to repeat the operation as many times as necessary for the job in hand. Depending on the client requirements, multi-strand stressing heads of any configuration can be supplied. The 900-tonne hydraulic stressing cylinder are tested for both safety and function and can be calibrated for the stressing load required. Because of the widely differing requirements of different projects and customers, Enerpac stressing cylinders are typically customized to individual requirements, with adaptations in this case being undertaken in New Zealand by Jonel Hydraulics to save time and simplify setup. “We also modified the cylinder’s wedge plate and fixed it to the ram, which means everything is in place to make it quick and simply to perform the task.” An anti-rotational guide was also fitted which stops the ram from rotating during the extending process. Jonel Hydraulics also supplied and fitted Enerpac high flow couplings and adaptors to suit the customer’s pump. 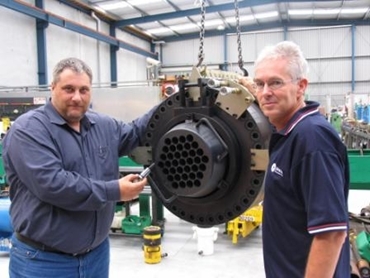 The 900-tonne hydraulic stressing cylinder was purchased by Post Tensioning and Grouting with the view of extending the range of stressing jacks available in New Zealand. The inclusion of the 900-tonne hydraulic stressing cylinder now gives Post tensioning and Grouting a comprehensive range starting from 20 tonne to the new 900-tonne hydraulic stressing cylinder.